The answer, she decided, would come at this year’s Passover seders — hundreds of seders in the United States and Canada. Fienberg is the founder, and fundraiser from volunteer contributors, of “2 for Seder” (2forseder.org), an independent, “grassroots” organization that is encouraging members of the Jewish community to invite two non-Jews — including at least one who has not attended a seder before — to their seders. It’s what Joyce Fienberg would have wanted, her daughter-in-law says. If anti-Semitism, like all forms of prejudice, stems from ignorance of a hated group of people, a seder’s hours of ritual and readings and socializing “gives you an idea of what Jewish people are about,” says Fienberg, who married into a Pittsburgh family and has frequently visited the Pennsylvania city. Whereas questions about Jewish culture and practice might seem out of place at a standard Shabbat or yom tov meal, a seder “is designed to ask questions,” she says. Drawing on her professional experience, Fienberg has promoted her initiative through social media and the cooperation of several partnering Jewish organizations, and has produced a seder kit for people hosting a Pesach evening meal this year. The kit includes some background on anti-Semitism, a suggested introduction to the seder, a guide to the Haggadah, a “Passover Popovers” recipe (Joyce Fienberg’s), discussion questions from Rabbi Evan Ravski of Congregation Olam Tikvah in Fairfax, Va., and an essay from Tree of Life’s Rabbi Jeffrey Myers. Fienberg’s goal is to have the leaders of at least 1,000 participating seders invite a pair of non-Jewish guests. Several hundred seder leaders across the U.S. and Canada had signed on by early this week, she says. 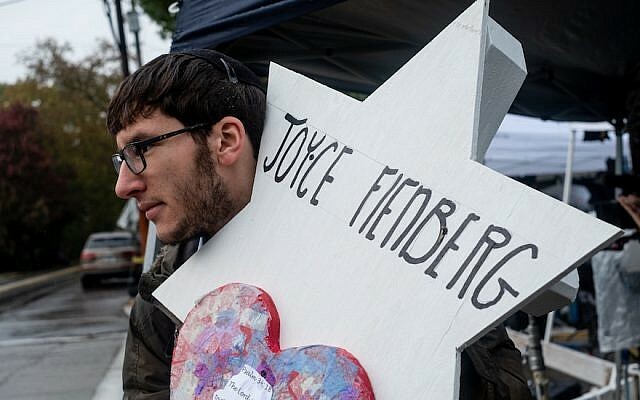 Joyce Fienberg, a Toronto native and a retired researcher at the University of Pittsburgh, was an active worshipper and volunteer at Tree of Life in recent years. Fienberg says her late mother-in-law, whose husband died in 2016, frequently invited guests from outside the Jewish community to Shabbat and holiday meals. Steve Lipman is a staff writer for The New York Jewish Week, NJJN’s sister publication.